The constellation Fornax. Roll mouse over to see labels. 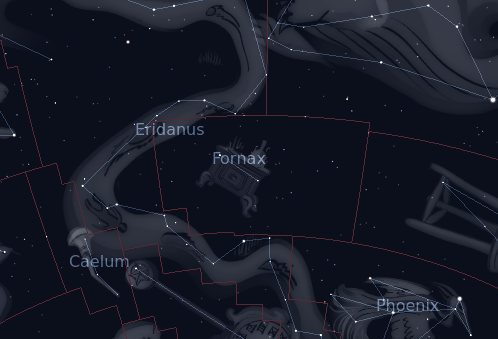 Fornax is a faint constellation in the southern sky, visible in the evening sky in the months around October. Its brightest stars are of fourth magnitude, but it is best known for some of its extremely faint deep sky objects. Lying well away from the plane of the Milky Way, Fornax offers an extremely good window on the distant Universe. 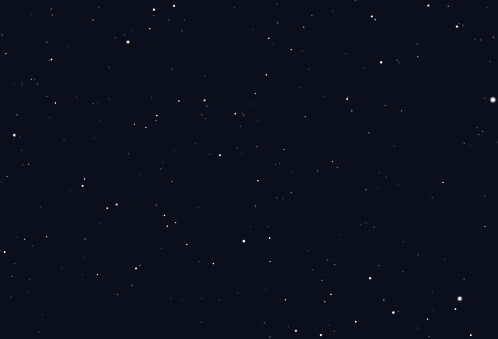 Even compared to other similarly dark sky areas, Fornax offers unusually large areas of sky where there is minimal obscuration from nearby material. For this reason, it was chosen for the Hubble Ultra Deep Field. Other deep sky objects of interest include the Fornax Dwarf galaxy – a nearby companion to the Milky Way – and the Fornax Cluster of galaxies. Both, however, require a large telescope and exceptionally dark skies to be seen. The name ‘Fornax’ was given to this sky area by Nicolas Louis de Lacaille in 1756. It is Latin for ‘furnace’. Fornax contains the following Caldwell object: C67. The following constellations neighbor Fornax: Cetus, Eridanus, Phoenix, Sculptor.